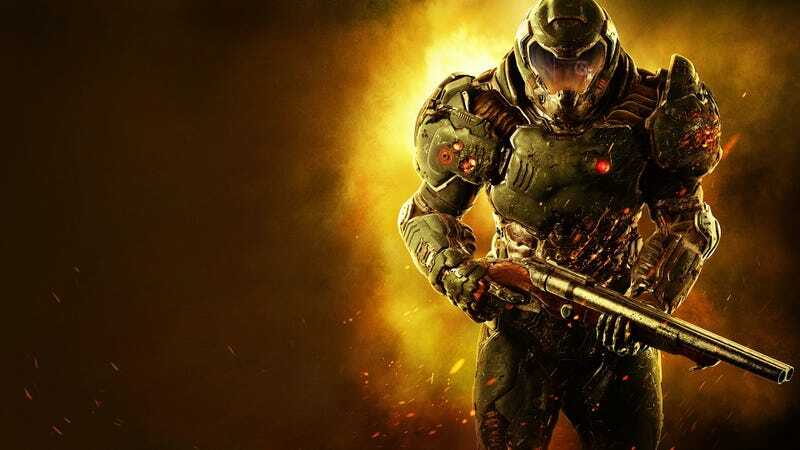 There’s a free demo of id Software’s excellent Doom revival right now. It was supposed to be removed already, but it’s proven pretty popular. This brief taste of Doom was announced at E3 and treated as news, but since when did a demo become something to be celebrated? When publisher Bethesda Softworks revealed Doom was getting a demo, they made a reference to shareware. In the PC community, shareware was shareable versions of software—with limitations. For the original Doom, the shareware version featured a single episode with nine levels. The new Doom demo only features one level, but it’s still a great look at the game. Anyway, point being: demos have a long history in video games and PC games. Growing up, receiving demo discs from PC Gamer and various console magazines was the highlight of my month. Given that I couldn’t afford many games at a time, demos were priceless, an opportunity to play games that I might never, ever try or experiment with otherwise. I played the crap out of the demos for games like BioForge and Crusader: No Remorse, which quickly became some of my all-time favorites. And how come I fell in love with Tobal No. 1? That magical Final Fantasy VII demo. Even in the absence of demos, my parents used to drop me off at the local FuncoLand, a gaming chain long since purchased by GameStop, where the associates would let you try any game on the shelf. Though this was a time before the Internet allowed people to watch trailers and Let’s Play videos, there was something fundamentally different about playing. People forget some of the fascinating policies that Microsoft deployed for Xbox Live. It used to be the case that every game featured in Xbox Live Arcade needed a trial version, aka a demo. (I believe some non-Arcade games also had trials, but it wasn’t a standard.) Some demos were better constructed than others, but regardless, you could count on a chance to actually play the game you were being asked to pay money for. That’s no longer the case in 2016, with demos replaced by highly controlled marketing campaigns, Let’s Play videos, and streaming. Granted, two of those options provide a decent look into the quality of games, but each lacks the fundamentally important experience of playing. When I looked up the demo section on Xbox One today, it has 33 demos. On PS4, there are 83. Some of them, such as Far Cry 4, are actually exclusive to PS4. That’s how far the demo has fallen: it’s now an exclusivity bargaining chip! Steam has more than 1,000 demos, but that obscures the point: you can’t rely on demos as a way to gauge if a game is any good. It’s why the addition of refunds to Steam’s service has proved so important. Sure, it can be abused, but it fills the gaping hole where demos used to be. I’ve seen plenty of players talk about how they use Steam’s refund service as a means of trying out games and I can’t blame them. When I’ve brought this idea up to developers over the years, I’ve heard the arguments for why demos have been quietly killed. Besides the additional work required to build one, lots of developers fear a demo could be all a player wants from the game. If the demo is enough, why pay for it? I get it, and it’s likely demos are a thing of the past, something to be trotted out as a surprise. That doesn’t mean I have to be happy about it.